Stephen Goss is a witty eclectic composer, the wit sometimes humorous, sometimes perhaps better characterized in the way the Elizabethans did, as a kind of mental sharpness which is alert to resemblances and which often operates by the revelation of unexpected resemblances and connections. Something of the sort is at work (play?) 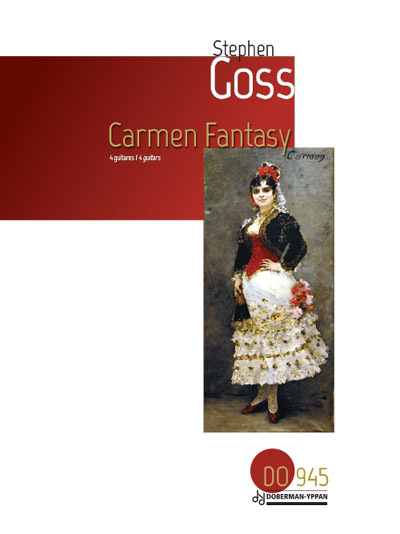 in Goss’sCarmen Fantasy. The five movements of the work (Torero – Habanera – Aragonaise – Seguidilla - Gypsy Song) naturally incorporate materials from Bizet’s opera, but they also draw on, for example, Debussy’s ‘Soirée dans Grenade’ and ‘La puerta del Vino’, de Falla’sHomenaje (Le Tombeau de Debussy)and Horowitz’sCarmen Variations. We are talking about far more than mere arrangement here. Goss’s music is music in conversation with these earlier scores, a conversation which questions, makes witty observations, repeats ‘remarks’ in a different tone of voice, as it were, and plays many other serious games with its sources. So, for example, the opening movement takes as its starting point Escamillo’s act two aria but inter-cuts music from this with material from the close of act four of the opera. The second movement is well described by the composer as having "a sultry, three-in-the morning atmosphere"; the marvellous third movement begins with some passionately percussive work, allows a brief cadenza, before a controlled frenzy of flamenco influenced rasguado-work and finally metamorphoses into a version of Carmen’s first act aria, ‘Tra la la’. In short, this is a delightful, intelligent piece of music-making.